Tucked away near the waterfront in Sausalito is the Industrial Center Building a.k.a. the ICB. While the interiors show off the industrial ship building history of this fantastic building, the occupants are all about art. There are 140 Marin artists who have studios at the ICB, and every type and style of art imaginable is on view, and for sale. If you’re planning a getaway to Marin on the weekend of Friday November 30 - Sunday December 2, 2018, a visit to ICB Winter Open Studios Art Market is a must! Almost 100 artists will open their studios on those days from 11 a.m. to 6 p.m.
And if not this year, mark your calendar for next year since the Open Studio at ICB takes place the first weekend of every December. In fact 2018 is the 50th year, so happy birthday to ICB and the amazing artists past and present! Other ways to visit are during Marin Open Studios in May of every year, or during pop-up events, art classes, private exhibitions, and lectures, and by appointment. Sign up for the ICB newsletter to get advance notice on all of those things. Also, on that page you can view past newsletters to get an idea of the activities at ICB, as well as info on who teaches classes. Trust, having an art lesson in this amazing spot by a local artist is an only-in-Marin vacation experience you’ll remember forever. A corner of Julie Harris’ studio, and Julie in the center. Hi Julie! Julie Harris creates multi-layered abstract works that we promise will pull you in and keep you there. Her studio in ICB (278E), is bursting with her bright and colorful work. It’s a happy and optimistic place, and Julie is a delight! Plan to spend some time in Bibby’s studio, she’s prolific! 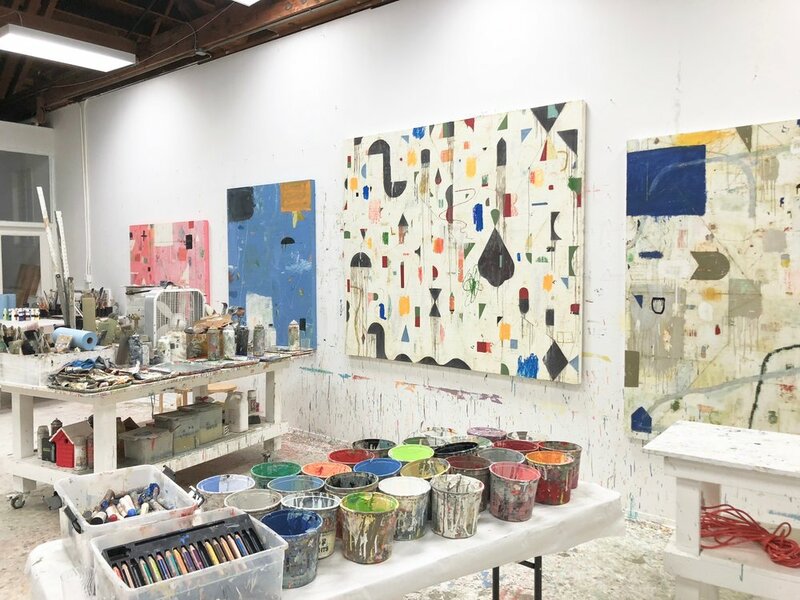 Bibby Gignilliat’s bold and joyful work is on display in her huge studio (235). Bibby also teaches popular mixed media classes in her studio. If you are visiting Marin when she’s offering one of these, just YES, do it! Nicholas Wilton’s works, some in progress. Nicholas Wilton’s studio (300W) is a big wow. You’re definitely going to walk in on a work in progress, and you will be captivated by both the process and the feelings that his work creates. Tres Nomad is a woman owned and operated slow fashion company run by Jasmien Hamed. 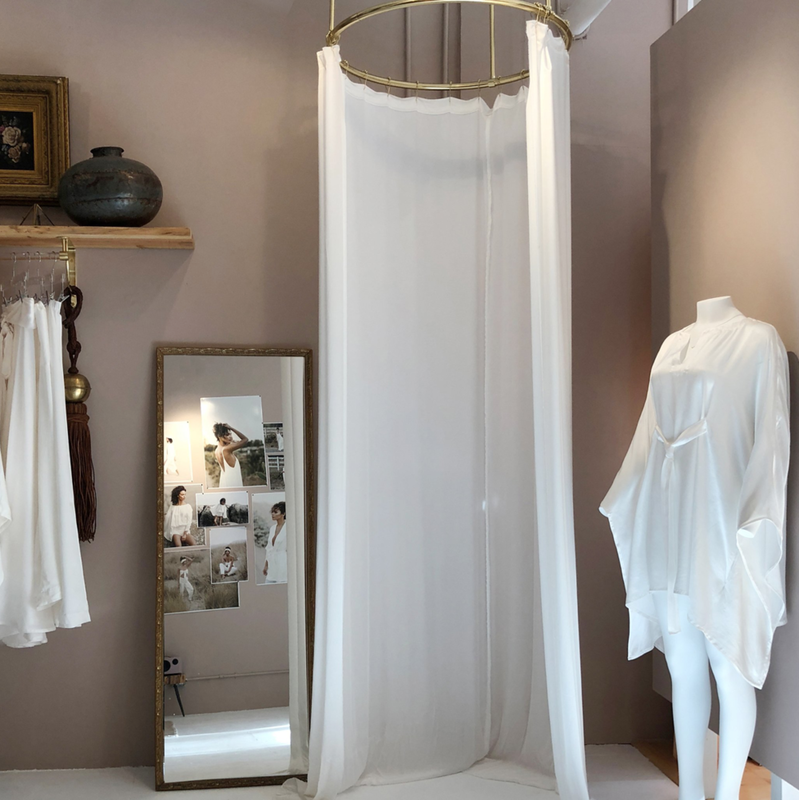 She creates tailor-made garments in her studio (271) from the most beautiful silk you have ever seen. (Okay yes, someone around here has the low back dress in cherry. And it is life-changing.) You can make an appointment with Jasmien to select your garment and color, and she’ll do your fitting. A few weeks later, voila, a stuuuuuning memory of your Marin vacation arrives in the mail! For our guests at Marin Hotels, ICB is about a 5 minute drive from Acqua Hotel, about 15 from Mill Valley Inn and Waters Edge Hotel.